← Drawing Then at Dominique Lévy Gallery. The “Geometric Cabinet” at Kristen Lorello Gallery is an exhibition based on an instructional tool used in Montessori early childhood education to teach geometry. 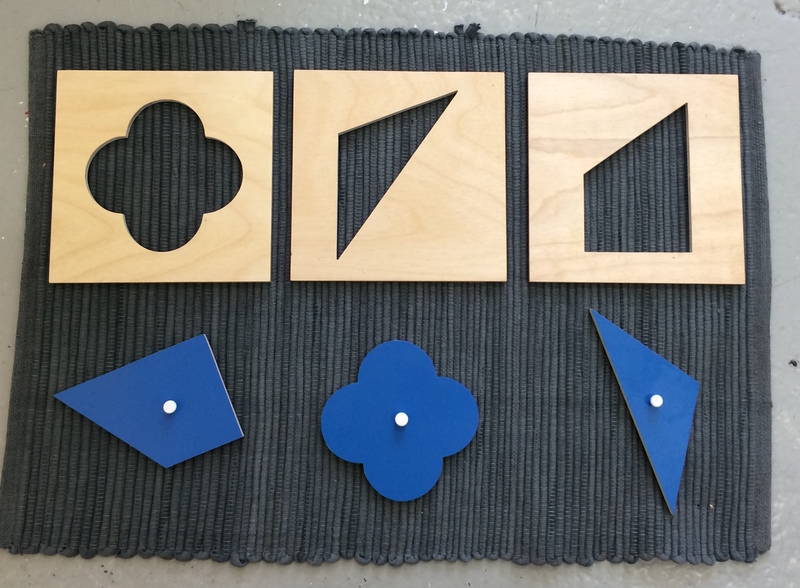 This tool consists of 6 puzzle-like drawers with removable trapezoids, triangles, quatrefoils, and other shapes. The children learn about the shapes by running their fingers along the edges of the shapes, as well as the process of fitting the shapes into the corresponding cutout frame. Two of these drawers are laid out on mats on the floor of the gallery. Kristen Lorello has curated this exhibition by selection work that relate to these geometric shapes and the prescribed educational activities. The work of eight artists has been included included in this show. There is a kinetic, rotating, circular stone-like wall sculpture by Rachel Higgins that reminds the viewer of the tactile experience of a young student running their fingers along the curved sides of the circular shape taken from the cabinet. 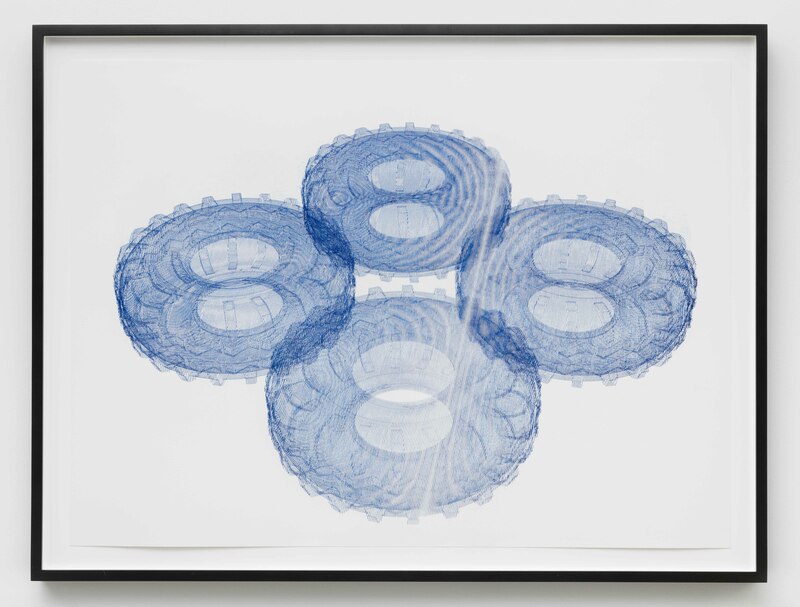 Michael DeLucia has provided a direct response to the quatrefoil shaped piece with his drawing “Quatrefoil” . “Quatrefoil” features a 2-dimensional depiction of four tire-like tori. A torus is a 3-dimensional topological form that has genus one. This means it has only one hole, like a bagel. The tori have been drawn in perspective so that front single torus is larger and in the foreground. There is a pair of tori in the middle ground and the smallest torus in the background. Through this work De Lucia has not only referenced the basic geometry of the flat cabinet shape but he elevated the quatrefoil to a complex form. The structure of each torus has been expressed by drawing a series of circles rotating in 3-dimensional space around a circular axis. Adding the tire tread element to the shapes gives the form a textural quality that take the drawing out of the realm of text book figures. The exhibit Geometric Cabinet has one of the most interesting curatorial premises I have encountered. The history and principles of Mathematics education are a fertile ground for creative interpretation and Kristen Lorello has presented a thought provoking selection and installation to explore these ideas.